Pillow lavas are lavas that contain characteristic pillow-shaped structures that are attributed to the extrusion of the lava under water, or subaqueous extrusion. Pillow lavas in volcanic rock are characterized by thick sequences of discontinuous pillow-shaped masses, commonly up to one metre in diameter. They form the upper part of Layer 2 of normal oceanic crust. Pillow lavas are commonly of basaltic composition, although pillows formed of komatiite, picrite, boninite, basaltic andesite, andesite, dacite or even rhyolite are known. 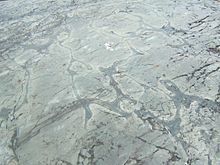 In general, the more felsic the composition (richer in silica - resulting in an Intermediate composition), the larger the pillows, due to the increase in viscosity of the erupting lava. They occur wherever lava is extruded under water, such as along marine hotspot volcano chains and the constructive plate boundaries of mid-ocean ridges. As new oceanic crust is formed, thick sequences of pillow lavas are erupted at the spreading center fed by dykes from the underlying magma chamber. Pillow lavas and the related sheeted dyke complexes form part of a classic ophiolite sequence (when a segment of oceanic crust is thrust over the continental crust, thus exposing the oceanic segment above sea level). The presence of pillow lavas in the oldest preserved volcanic sequences on the planet, the Isua and Barberton greenstone belts, confirms the presence of large bodies of water on the Earth's surface early in the Archean Eon. Pillow lavas are used generally to confirm subaqueous volcanism in metamorphic belts. Pillow lavas are also found associated with some subglacial volcanoes at an early stage of an eruption. They are created when magma reaches the surface but, as there is a large difference in temperature between the lava and the water, the surface of the emergent tongue cools very quickly, forming a skin. The tongue continues to lengthen and inflate with more lava, forming a lobe, until the pressure of the magma becomes sufficient to rupture the skin and start the formation of a new eruption point nearer the vent. This process produces a series of interconnecting lobate shapes that are pillow-like in cross-section. The skin cools much faster than the inside of the pillow, so it is very fine-grained, with a glassy texture. The magma inside the pillow cools slowly, so is slightly coarser grained than the skin, but nevertheless it is still classified as fine grained. Vesicles are found towards the top of a pillow (because the gas trapped as part of the rock is less dense than its solid surroundings). The pillow structures show a convex (rounded) upper surface. The pillows might have a tapered base downwards, as they may have moulded themselves to any underlying pillows during their formation. ^ "McCarthy, T. & Rubidge, B. 2008. The story of earth and life, Chapter 3, The first continent. 60-91, Struik Publishers" (PDF). Web.wits.ac.za. Archived from the original (PDF) on 2009-04-07. Retrieved 2014-03-10. ^ Fang, N.; Niu, Y. (2003). "Late Palaeozoic Ultramafic Lavas in Yunnan, SW China". Journal of Petrology. 44 (1): 141–158. Bibcode:2003JPet...44..141F. doi:10.1093/petrology/44.1.141. ^ Kuroda, N.; Shiraki, K.; Urano, H. (1988-10-01). "Kuroda, N., Shiraki, K. & Urano, H. 1988. Ferropigeonite quartz dacites from Chichi-jima, Bonin Islands: Latest differentiates from boninite-forming magma, Contributions to Mineralogy and Petrology, 100, 129-138". Contributions to Mineralogy and Petrology. 100 (2): 129–138. Bibcode:1988CoMP..100..129K. doi:10.1007/BF00373580. Retrieved 2014-03-10. ^ Walker, George P L. (1992-08-01). "Walker, G.P.L. 1992. 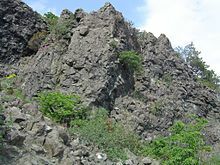 Morphometric study of pillow-size spectrum among pillow lavas, Bulletin of Volcanology, 54, 459-474". Bulletin of Volcanology. 54 (6): 459–474. Bibcode:1992BVol...54..459W. doi:10.1007/BF00301392. Retrieved 2014-03-10. ^ Harmon, Russel S.; Rapela, Carlos W. (1991). Andean Magmatism and Its Tectonic Setting. Geological Society of America. p. 24. ISBN 978-0-8137-2265-8. ^ "Scientists Study 'Glaciovolcanoes,' Mountains of Fire and Ice, in Iceland, British Columbia, US ScienceDaily, Apr. 23, 2010". Sciencedaily.com. Retrieved 2014-03-10. ^ 2005. Volcanoes and the environment by Joan Martí, Gerald Ernst, Cambridge University Press, 488 pp. ^ H. Furnes and F. J. Skjerlie (1972-07-01). "Furnes, H. & Skjerlie, F.J. 1972. The significance of primary structures in the Ordovician pillow lava sequence of Western Norway in an understanding of major fold pattern. Geological magazine, 109, 315-322". Geolmag.geoscienceworld.org. Retrieved 2014-03-10.